I don't ordinarily like "message" movies, particularly religious ones, and generally avoid them. Ordinarily they are moralistic, simplistic, weak on context, lacking in subtlety and nuance, mediocre in production values. That's probably the reason that the 1989 biopic Romero sat unwatched on my shelf of DVDs for several years. For some unaccountable reason I decided recently to take it down and watch it. At first I thought, here we go again. But thanks largely to a refined, dignified performance by the late, charismatic Puerto Rican actor Raul Julia, I found it deeply moving. [The Salvadoran judge] found “clear and convincing evidence” that General García “assisted or otherwise participated” in 11 violent episodes that scarred the Central American country, including the 1980 murder of Archbishop Óscar Arnulfo Romero as he was saying Mass in the capital, San Salvador. The judge also found that General García helped conceal the involvement of soldiers who killed four American churchwomen later that year. He “knew or should have known” that army troops had slaughtered the villagers, including women and children, in the hamlet of El Mozote in December 1981, Judge Horn ruled. Through the window she saw soldiers leading groups of men from the little whitewashed church—blindfolded men whose hands were bound behind them. Each pair of soldiers led five or six men past the house of Alfredo Márquez and took them out of the hamlet in various directions. After a time, she saw her husband in one group, and as she watched, along with young Cristino, who had climbed up next to her, eager to see what was happening, they both saw him—Domingo Claros, twenty-nine-year-old woodcutter, husband of Rufina and father of Cristino, Maria Dolores, Marta Lilián, and María Isabel—bolt forward, together with another man, in a desperate effort to escape the soldiers. But there was nowhere to run. The men of the Atlacatl leveled their M16s and brought both men down with short bursts of fire. Then the soldiers strode forward to where the men lay gasping on the ground, and, unsheathing their machetes, they bent over them, grasped their hair, jerked their heads back sharply, and beheaded them with strong blows to the backs of their necks. Finally, in October, the experts began to dig. And there, on the third day, in the silence of the ruined hamlet of El Mozote, all the words and claims and counterclaims that had been loudly made for eleven years abruptly gave way before the mute force of material fact. The bones were there, the cartridges were there; the sleeping reality of El Mozote had finally been awoken. This Holy Week, it is not just the sins of individuals that need to be confessed, but the sin of entire societies including our own, and the grip of the power of Sin on the whole human family. The film about Archbishop Romero barely scratches the surface, but it may impress you enough to want to learn more. 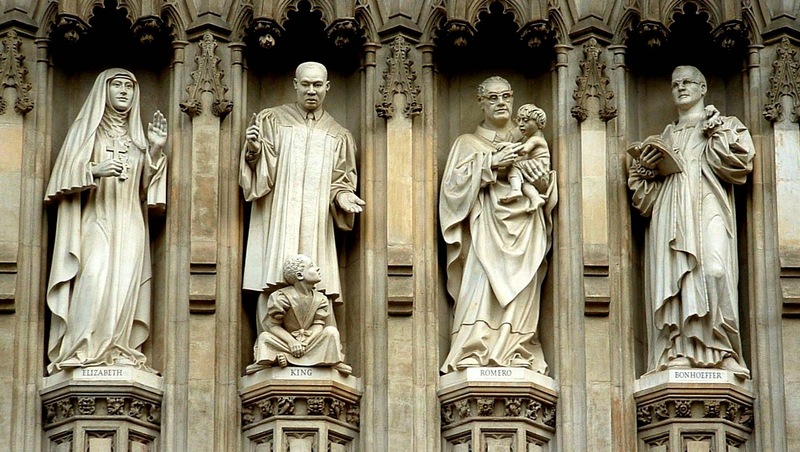 Romero is one of the 20th century martyrs whose statue was placed above the entrance to Westminster Abbey in 1997.